We are proud to announce we have been shortlisted as a finalist in the New Firm of the Year category of the Accounting Excellence Awards 2018 #AE18. This is a national award celebrating excellence in the accountancy profession. Jon Gifford said: “We are thrilled to be a finalist in the New Firm of the Year category of these awards, it is one of the UK’s most prestigious accountancy honours. Giffords are the only firm in Devon to be shortlisted in the Accounting Excellence Awards this year. We established Giffords with old fashioned values to provide excellent service and putting our clients first. Being shortlisted as a finalist in these awards recognises what we have achieved in just 12 months and showcases our commitment to quality and service”. The Awards, organised by Accounting Excellence, are now in their 8th year and celebrate the exceptional calibre and achievements of ambitious accountancy firms. This year’s winners will be announced in a ceremony hosted by Channel 4’s Rachel Riley at the InterContinental, Park Lane, London in September. 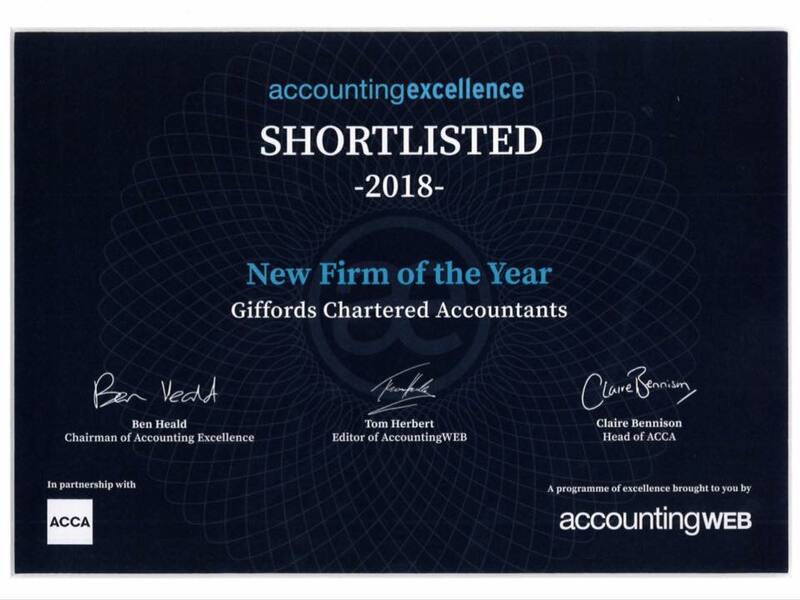 In celebration of this shortlisting, Giffords are delighted to offer a free initial consultation to businesses and individuals. Please contact Giffords on 01805 625439 to book your appointment.